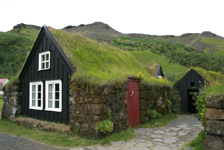 Green roofs aren't new. They've been around for centuries in places like the Faroe Isles, Iceland and in Europe. Villagers routinely planted Sempervivum, also called 'Jove's Beard' to protect their thatched roof cottages from lightning. Even the first pioneers in North America used this technology to build their first shelters on the plains. In these cases, most often the plants used were sod cut from the prairie and turned upside down to make a kind of thatch, which then grew from the roots or seeds in the attached soil. This explains the name - 'soddie'. I can only imagine that it didn't hold out the rainfall all that well, so you would have muddy water streaming onto your bed in a downpour. Luckily, that's all changed. No longer will you have water, let alone mud, coming in through your roof meadow. We now have access to many great products to make it easier to construct and utilize this method of greening your house or outbuildings. With all the interest in green roofs around the world, it's only a matter of time before they become almost commonplace. I don't think they'll ever lose their appeal. From cities to rural farms, you'll increasingly find green roofs on all types and kinds of buildings. Sometimes the phrase 'green roof' also is taken to mean a roof of regular construction that has some added green technology such as solar panels. I'm using the phrase strictly to mean a roof planted with green plants. In Toronto, a new by-law has mandated that as of 2009, a certain percentage of new construction must have green roofs. This is great news for a city, as the 'heat island' effect is incredible as the sun's warmth builds up around all the flat roofs. If it can lessen the heat, and also prevent heat loss in winter, reduce damage of the roof structure by protecting it from ultraviolet rays, and provide wildlife habitat, that's all good. 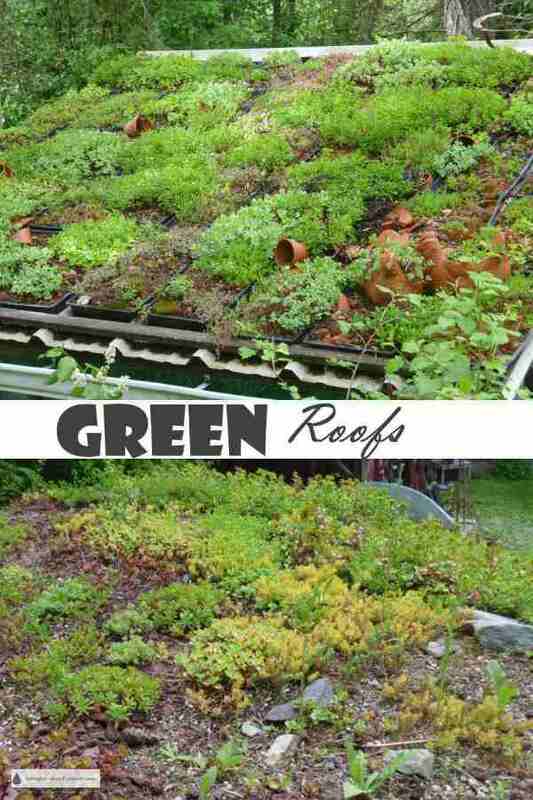 You can also benefit from the many new products out there for green roof construction. Start small with an extensive green roof on a shed, Glory Be; the earth sheltered root cellar, chicken house or playhouse, and see if you like the way it performs. For even smaller projects, build a green roof on your doghouse, or make a customized miniature green roof for the birds on a bird house. An easy option is building a modular green roof, which has the advantage of speed and ease of handling, as well as almost instant color and texture if the modules are pre-planted and rooted off site. It does take some prior planning building any kind of green roof; the building itself will have to be engineered to take the extra weight of wet green roof soil, plants, snow load (it won't slide off a planted roof!) and so on. If you plan on having a seating area on your green roof, decide on this early in the planning stages to make sure your structure will take the additional weight of furniture and people. Deciding on which plants to use can be steep learning curve. You may decide to have a meadow or savanna with grasses and wildflowers, or stay with one type of Sedum, a mix of green roof Sedum, Sempervivum and bulbs for that punch of colour, or any combination thereof. 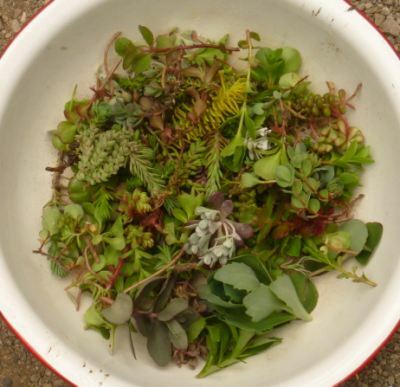 The most economical way to plant a green roof is with unrooted Sedum cuttings, like the ones in the picture below, or alternately Sedum plugs or modules already rooted. 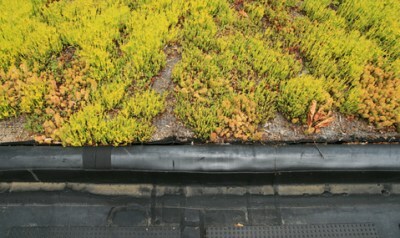 This makes for an almost instant green roof and is used most commonly on large projects. The characteristics for any plant to thrive on your green roof are that it must be heat and cold tolerant, able to withstand windy conditions similar to a mountain top, and drought resistant, with the added ability to soak up excess moisture to release it slowly later on. It's a tall order for most plants to cover all the criteria, but if you look for plants that originate in alpine conditions or desert type climates there's a good chance that those type of plants will survive the similar conditions of growing on a roof top. Many hardy succulents fulfill all of these criteria. Storm water mitigation, meaning that in a torrential downpour water that normally would leave the roof immediately and flood your garden in it's haste to get to the lowest spot and escape, will be stored for a slower paced release to the ground by your roof. Heat reduction in summer, not only on the building that houses the roof, but in the surrounding city. This is a win/win situation, as cooling needs will be lower too, meaning less energy consumption for air conditioning. Heat retention in winter, because the extra layer of soil and plants will increase the insulation on the buildings roof. Beauty! People need to have something natural and beautiful to look at in their stressful lives. It's an interesting fact that in offices that look out onto a green roof, there is much less absenteeism. I guess everyone can't wait to get to work to see how the green roof looks today!